Johann Sebastian Bach, was active at the Count of Schaumburg-Lippe’s court in Bückeburg from 1750 until his death on 26 January 1795. When Friedrich came to the North German capital in 1750, shortly before his 18th birthday, he demonstrably until then had no other teacher than his father. In Bückeburg, however, he immediately became acquainted with a music style that he could scarcely have encountered previously: the music of the Italian operas and cantatas, as well as the instrumental compositions, of the high Baroque. The ensuing appointment to Bückeburg of the poet and theologian Johann Gottfried Herder in 1771 represented for Friedrich a further artistic stimulus which particularly enriched his church music. 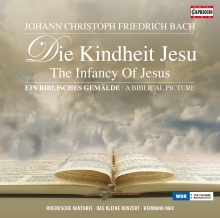 Towards the end of 1772 Herder wrote the poem Die Kindheit Jesu, to which he gave the subtitle "a Biblical picture". 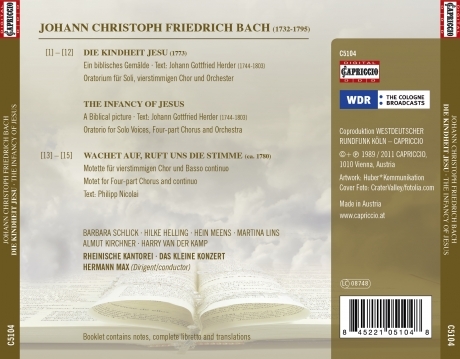 He sent the poem as a Christmas gift to his bride Caroline Flachsland in Darmstadt: at the same time he entrusted the text to Johann Christoph Friedrich Bach to set to music. The completed work was performed for the first time on 11 February 1773 at the Bückeburg court.